Today's post is all about the decor and goody bags. I didn't go overboard, but I just had to make something cute to be put on the table. 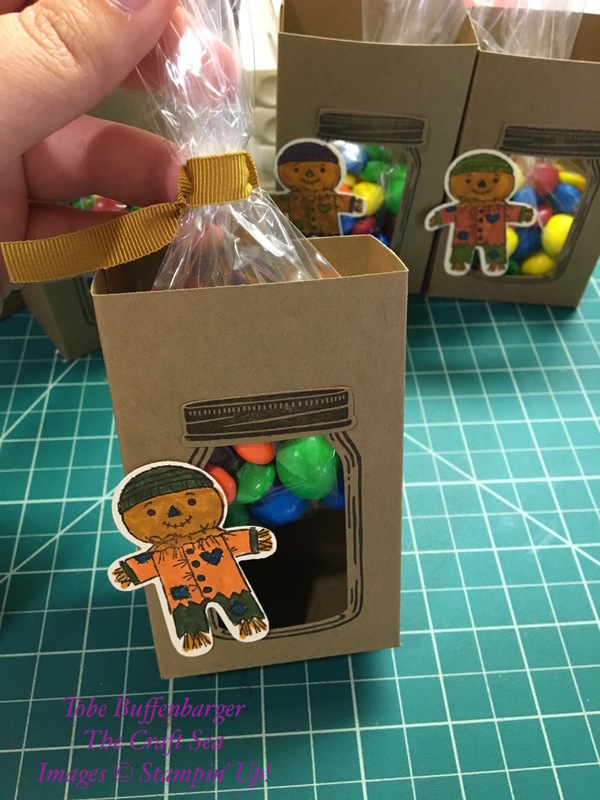 I found a tutorial online for this adorable little treat boxes. Once I stamped and die cut the jars, I added some cute punched scarecrows from last year's stamp set. Inside, there are bags of M&Ms tied with with some great retired Delightful Dijon ribbon. For the goody bags, I bought some plain kraft gift bags in bulk. Seriously I got 50 bags for super cheap. Thanks Amazon! For there, I found some leftover die cut flowers from about three years ago. I used the patterns and colors as my palette. I punched some tags and stamped them all over with the retired Four Feathers stamp set. I finished off the tags with copper thread and the rest of the feathers. The tags were attached to the bags with some great retired Blackberry Bliss Ribbon.